Chauchilla Cemetery is located south east of the city of Nasca at 28km. This necropolis dating back over 1,000 years belongs to the regional culture Ica – Chincha (late period of the Nasca Culture). For many years it was plundered by grave robbers who in their intention to steal the treasures destroyed much of the site, taking many valuables as textiles, ceramics with them and leaving naked corpses and graves completely destroyed. Visit the sacred cemetery Chauchilla can be done in the morning or afternoon. We take the Panamerican highway to the south for about 20 kms. We make a detour on a road in the desert about 8 km long and reach the Chauchilla necropolis. 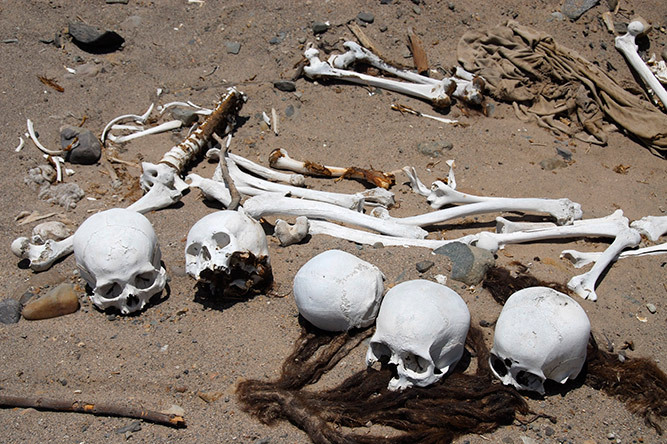 Here we can clearly understand the mummification process and customs of the ancient Nasca. In this cemetery we can see remains of ceramics, textiles and mummies with long hair (over two meters long rasta type), original tombs with mummies mummified in fetal position and also children. We will provide guides who will give accurate information about the process of mummification. Returning to the city we will make a short visit to a pottery studio where we explain and demonstrate how the people of this civilization made their pottery for thousands of years. To end this tour will visit a place where gold miners processed with a technique that dates back to colonial times using large stones that serve as mortars, water and mercury. Here you will get the explanation of the process that this work involves and be able to understand all the labor behind a gold nugget. End of service and return to your hotel.